Amnesty International, the human rights organisation, challenges the free to make some noise on behalf of those who are being unfairly imprisoned, tortured and put to death. Soldiers walk through dimly lit concrete corridors until they reach a waiting prisoner. We see them take the prisoner and throw him against the floor. A machete is used to cut his hand off. “No”, screams the prisoner. But no one can hear. The scream, the yell, is channelled through a young man standing in a shopping mall. 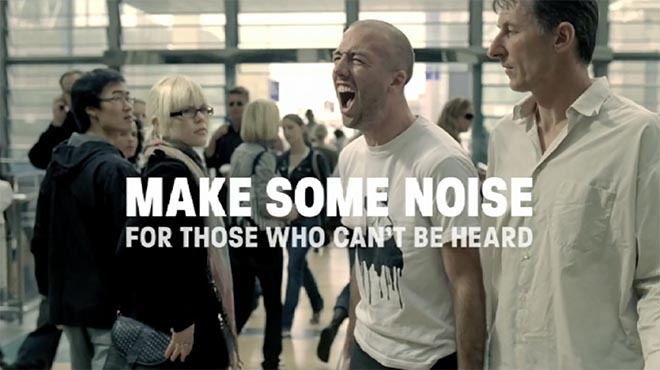 “Make some noise for those who can’t be heard”. Amnesty Make Some Noise was developed at Publicis Mojo Auckland by executive creative director/copywriter Nick Worthington, copywriter Karl Fleet, art director Lorenz Perry, agency producer Jodie Hari. Filming was shot by Perry Bradley via Film Construction with producer Jozsef Fityus and editor Steve Cox. Post production was done at Digipost. Sound was designed at Liquid Studios.